TenThings Jewelry: easy. 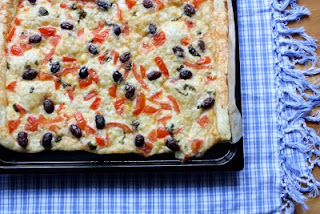 puff pastry olive cheese tart. I have planned for this weekend. Preheat oven to 400º F (200º C). Line a baking sheet with parchment paper. On a lightly floured surface, roll the puff pastry out into a 12 x 18" rectangle. Transfer to prepared baking sheet. Brush pastry thinly with Dijon mustard, then cover completely with sliced Swiss cheese. Sprinkle on chopped tomatoes, then the black olives, and dust with chopped fresh basil, salt and pepper to taste. In a small bowl, combine the chopped garlic with the olive oil, then drizzle the mixture onto tart. Bake for 20-30 minutes or until cheese in the middle of the tart is bubbly. If the puff pastry starts to rise unevenly, just prick it with a fork and continue baking. Serve warm, cut into squares, with a nice summer wine or drink of your choice. Enjoy! please visit stephanie levy's pretty, little etsy shop.